My family and I would like to visit Scotland for Hogmanay but ideally Id like to be in a town or village (or Edinburgh or Glasgow if that's best). Linlithgow is a really nice town. The train station is right there and it's 25 mins to Edinburgh and 35 (ish?) to Glasgow. @jcoo take a look at the previous discussions on Hogmanay in Scotland. For further inspiration please check out the Visitscotland website on celebrating Hogmanay in Scotland. Edinburgh at Hogmanay is spectacular! There is such an incredible buzz in the city and the fireworks at midnight are magical! 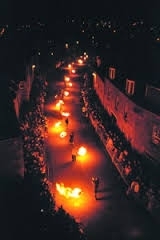 Stonehaven has the spectacular Fireball festival. I had a really good time last New Year in Balmaha at the Oak Tree Inn. Personally I think Edinburgh is the best place to experience Hogmany . You will not be disappointed as the festivities and build up to Hogmany begin a few days before . Something to suit all ages , most important a great Scottish welcome and atmosphere!